Why do I need A-Team Snow Removal? South Lake Tahoe is a beautiful place to live and visit. Your time here shouldn’t be spent shoveling snow. We’re here to remove your snow, so you have more time and energy to get out and enjoy what Tahoe has to offer. We use professional grade equipment, designed especially to cope with Tahoe’s heavy snow. What is the minimum amount of snow your service will remove? If you need us, call us. We’ll remove the snow you request. However, with an A-Team Snow Removal seasonal contract, you are guaranteed at least one service after 4 inches or more of snowfall, every 24 hours. Do you shovel stairs, decks, hot tubs, and patios? We shovel or use walk-behind Honda snow blowers to clear these areas. Call us for a free estimate for these services. Can your snow blowers handle Lake Tahoe winter conditions and heavy snow? Yes they can. We use Holder tractors with Pronvost snow blowers that have been designed for Tahoe’s heavy snow conditions. Why does A-Team Snow Removal use Holder tractors? Holder tractors have been proven to be the best at moving Tahoe’s heavy snow. These are very fast and efficient machines, and our use of them means lower costs for you. Can we call you when we need snow removal instead of buying a seasonal contract? When traveling to Tahoe, you won’t have to worry about rescheduling your snow removal service. What are the start and end dates of seasonal contracts? Seasonal contracts start November 1st and end April 30th. Download a seasonal contract here. You can either fill it out electronically or hand written. When do I need to sign up for seasonal service? You can sign up any time for a seasonal contract. Although, sign up by September 30th and you will receive $25 off your seasonal contract price. Yes. We offer a $25 discount if you sign your seasonal contract by September 30th and an additional $25 discount if you refer a neighbor who also, signs up for a seasonal contract (within 3 blocks of your property). A-Team Snow Removal accepts all major credit cards. What time of day do you remove the snow? We prefer to run our snow removal routes between the hours of 3 a.m. and 8 a.m. because that is the safest time for our operators and equipment due to minimal traffic on the roads. Typically, we’ll services your property once in the morning and then come back to clean up the next morning. Keep in mind, that we can’t always predict how Mother Nature is going to give us the snow. This means we are unable to tell you exactly when we are going to remove your snow. Whether it will be early mornings, evenings, or late night hours. Seasonal contracts come with unlimited driveways clearings from November 1st to April 30th. The berm is removed when we service your address. We will make every effort to return, but the amount of snow and operators availability may limit this ability. How close can you get to my garage door or car? A-Team Snow Removal’s equipment is highly maneuverable. In most cases we will work within one foot of your garage or vehicle unless the operator feels it is unsafe to do so. Do I need to protect my landscaping for snow removal? It is always a good idea to prepare your landscaping for winter by tying up small trees, shrubs, and bushes and stake your driveway for the winter. Our equipment won’t damage your landscaping if it has been prepared properly for winter. Do you cover repairs of any damage done to my property by your equipment? We carry a $1,000,000 general liability insurance policy, which covers damage from operator negligence. We are not responsible for superficial gouges and chain marks resulting from normal snow removal operations. We will not repair or pay for the repair of driveways that crush or deteriorate due to water saturation or thin asphalt. Will my driveway always be snow free? If Mother Nature would give us the snow the way we want it, then snow would fall for short periods of time, followed by long breaks in the weather. 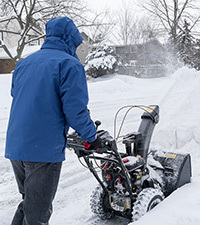 With an A-Team Snow Removal seasonal contract you are guaranteed at least one service after 4 inches or more of snowfall, every 24 hours, until your driveway is clear of snow. I only use my Tahoe house a few times a year; can I use your service on an on call basis? Emergency vehicles, in the event of a flood or fire will always have access at your address. What if there is more than one car parked in my driveway when you come to remove the snow? We will safely work around the parked car(s) and clean up any remaining snow on our next pass by your property. Because our routes are often cleared in the middle of the night, we will not disturb the occupants of the house to request removal of their cars. If possible, we ask that you park to one side of the driveway rather than in the middle. This enables us to clear the unoccupied side rather than nothing at all. What can you do for me, if a couple feet of snow has accumulated in my driveway, heavy snow is falling and I need to leave? When there is heavy snow in your driveway, there is heavy snow on the streets. We recommend you only leave if you can do so safely. We encourage you to check the Cal Trans road report to see if there are road closures in effect. Do I need to wait for my driveway to be cleared before leaving? No. Driving on the snow will only pack it, but with our regular snow removal it will keep it from turning to ice. What if one of my snow-stakes get knocked down? If you are unable to repair the snow stake yourself, give us a call and we will fix it. Please call us, if you have any questions – 530-318-9191. Yes we do. We carry a $1,000,000 general liability insurance policy. Yes we are licensed in the City of South Lake Tahoe and El Dorado County.